Let us help you plan your visit to Ollantaytambo! Stay for a few days or even a week. 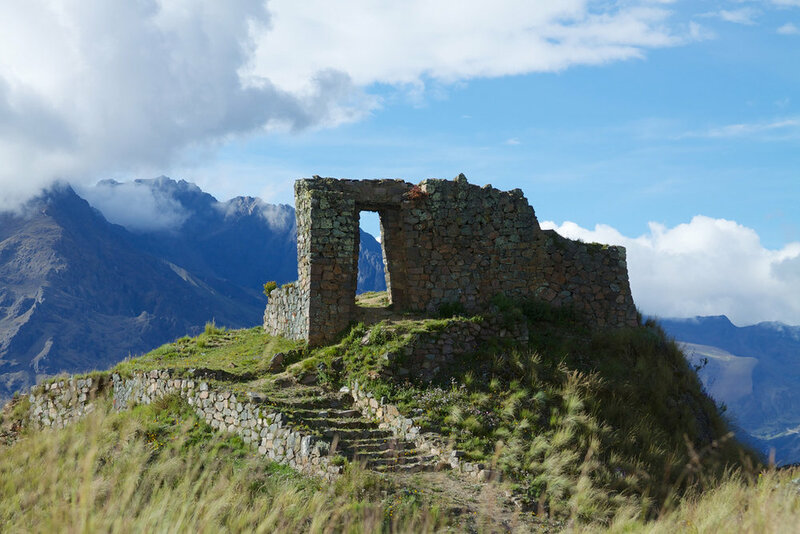 You will love your time here in our beautiful and mysterious town with its well-preserved traditional Inca architecture. Time travel 600 years back and walk down its orthogonal cobbled streets guarded by massive walls, listen to the glacier water flowing through the sequias, original Inca irrigation channels, breath in the pure air; can you feel the unique atmosphere? Need more information for Reservations or Activity Planning? The impressive terraced fortifications are Ollantaytambo’s main draw. The ruins, which will require you to buy the boleto turístico (tourist ticket to access archeological sites), are well worth the slightly demanding climb even if you are not a history enthusiast – the view is astonishing! On the opposite side of the valley, you will find more ruins on the sloping Pinkullyuna Mountain. Once again, there’s a beautiful and rewarding scenery waiting for you along the way. Take a journey into the heart of a Quechua community through an intimate community visit to learn more about the Pre-Incan weaving traditions and Andean indigenous culture. The trip begins with a beautiful drive, ascending nearly 1,000m, to the upper Andean community of Patacancha or Huilloc. Upon arrival, visit the cooperative's weaving center to learn about weaving and its significance in Andean culture. The trip includes a demonstration of the entire process, beginning with how alpaca or sheep wool is hand spun into yarn, how local plants are used as natural dyes, and finally how the yarn is woven into the final product. After the demonstration, you will have the chance to try weaving yourself and take home a bracelet you make with a community member. The day will end with a chance to purchase items from the women you met during your tour, providing you a chance to bring home a hand-woven memory from your trip. The round-trip hike to the ruins of Pumamarca takes about 4-6 hours from Ollantaytambo on a moderate, steadily climbing trail. The ruins of Pumamarca sit on a hillside overlooking the convergence of the Río Patacancha and the Yuracmayo (White River). The well-preserved site was thought to be a checkpoint to control access to Ollantaytambo. This round-trip walk, which takes 4-6 hours to the quarries and a few more to reach the Sun Gate, begins at the Inca bridge near Ollantaytambo and along the banks of the Río Urubamba. It follows a fairly well-preserved Inca trail to Cachicata, the stone quarry 700-900 meters above the valley floor that is visible from the Ollantaytambo sun temple. It was here that the great stone blocks were slid down the hillside and hauled across the river to Ollantaytambo. There are three separate stone quarries, within half a kilometer of one another, littered with massive chiseled blocks and small chullpas, or burial towers. The western and highest quarry contains mysterious needleshaped blocks that are up to seven meters long. The Pachamanca, which translates to "earth oven" in the Quechua language, is a traditional Incan meal cooked upon hot rocks at a high temperature below the surface of the earth using marinades and aromatics to create a delicious meal that is one with Pachamama (Mother Earth). Lessons & Lunch in traditional and contemporary organic farming practices. Observing the process of building and cooking food using the Pachamanca method. Tours can be done in the mountains, cloud forests, near various archaeological sites with the option of boxed lunches or a picnic. Other options: Zip lining, River Rafting, Horseback riding, ATV riding and mountain biking. The Sacred Valley’s Urubamba River has fantastic glacier fed rafting opportunities at rapid levels II to IV. All expeditions include wetsuits, life jackets, helmets and paddles. The trip will include a boxed lunch. Hosted by a classically trained Peruvian chef with knowledge of the bounty of produce and spices available in Peru. The classes are 3-4 hours long and include shopping in a local market, preparing an appetizer, main dish and beverage with the chef and enjoying the fruits of your labor afterward. This beautiful waterfall of Perolniyoc is located in the sacred valley of the incas , Ollantaytambo, the journey to the place you can see wonderful landscapes. On the same mountain is an Inca construction with the same name, its construction style corresponds to the pircado that is formed of stone and mud. around this attraction can also be observed of great variety of Species of flora such as sauco, queuña, Chachacoma, etc the Perolniyoc waterfall, is approximately 80 mts.